The Houses of Parliament, on the banks of the River Thames at Westminster, are among the most iconic buildings in the world. They have stood for generations at the centre of the United Kingdom's national political life, and have often been called 'the cradle of democracy'. 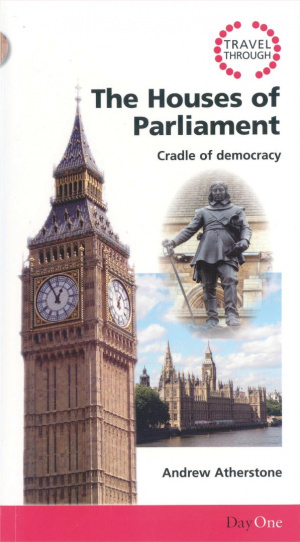 This book tells the history of Parliament from the Middle Ages to the present day, including such dramatic events as the Gunpowder Plot, the Civil War, the assassination of the Prime Minister, the suffragette protests and the Blitzkrieg. It shows especially how the Christian faith has shaped parliamentary debates and ideals through the centuries. Travel Through The Houses Of Parliame by Andrew Atherstone was published by Day One in March 2011 and is our 23178th best seller. The ISBN for Travel Through The Houses Of Parliame is 9781846252754. ?The Houses of Parliament ? Cradle of Democracy? is a well presented and illustrated publication which records Parliament?s varied and colourful historical characters, the influence of Christianity throughout its political movements in times of change and its place at the centre of our national heritage. The quality of presentation is impressive for a pocket sized publication and as well as presenting some of the artwork that appears in the Palace of Westminster, there are excellent illustrations of political figures, incidents and traditions. It is a fascinating guide in its chapters, in its short articles and its informal, yet well-informed layout. Readers are rewarded with important dates in Parliament noted here, travel information for people wanting to visit ?The Mother of Parliaments? and with excellent commentaries on how parliament has continued to be reformed. An important recurring theme though is that Parliament continues to have spiritual as well as political responsibilities. While it is noted that ?truth, righteousness, justice and liberty have not all flourished in national life, they remain foundational Christian virtues? in Parliament. Daily prayers continue to be held in the House of Commons and in the House of Lords and cross-party MPs Prayer Groups do convene regularly on matters of conscience. Parliamentarians down the ages have understood their public service as part of their service to God. A very approachable and enjoyable read. A very notable achievement for such a portable handy-sized publication. This next title in the Travel Through series is as detailed and informative as its predecessors. Beautifully presented in its sturdy hard wearing cover, shaped to slip into a pocket or handbag comfortably, but large enough to read with ease if you have taken it with you to London. Equally well, this book can be read in the comfort of an armchair, allowing your imagination to do the journeying.. The photographs on their own are a pleasure to browse through, but of course it is the well written story of the ‘Mother of Parliaments’ which is the main purpose of this book. Unlike a guide to a town where you can walk around at leisure, this is more of a guide to the history of the place, and it is well worth reading with its detailed descriptions and explanations of our history. A fund of information packed into such a small space. Excellent. Got a question? No problem! Just click here to ask us about Travel Through The Houses Of Parliame.